It is easy to be captivated by the thought of a holiday in Peru, exploring the ruins of Machu Picchu and navigating the waters of Lake Titicaca. While the popular sites are deservedly Peru's most famous tourist attractions, the country also boasts fine beaches, quaint fishing villages, epic hiking and walking trails, and the chance to experience a real Amazon adventure. Most first-time visitors to Peru come to walk the Inca Trail, a famous (typically four-day) hike to the 'Lost City of the Incas', Machu Picchu. However, a little-known fact about Peru is that about 60 percent of the country is covered by thick tropical rainforest. The Peruvian Amazon is lush and steamy, and home to an incredible amount of biodiversity, from large tropical flowers to howler monkeys and majestic jaguars. The two main entry-points, accessible by air, for a holiday in the Peruvian Amazon are Iquitos and Puerto Maldonado. From these cities, tours to isolated and eco-friendly jungle cabins can easily be arranged. There are many more wonderful sights in Peru, including the mysterious Nazca Lines, the impressive Colca Canyon, the warm sands and surf of Manorca and the wonderful wildlife of the Ballestas Islands. Peru's capital, Lima, is a little rundown but nevertheless boasts some fine Spanish-colonial architecture and a restaurant scene of international repute. The peak tourist season in Peru is from May to October, and it peaks in July and August. Winter, from June to September, is the best time for the Inca Trail due to the wonderful visibility of the clear, sunny days; this is also a good time to visit the Amazon basin, as mosquitoes are fewer and the animals stay closer to the water, making them easier to spot. Read more on Peru's Climate and Weather. - Manu National Park, located in the isolated Amazonian region of Madre de Dios, is the best place to see tropical wildlife in Peru. - Huacachina is an increasingly popular desert resort village built around a natural lake, offering fun dune-related activities like buggy rides and sandboarding. - Manorca boasts fine beaches and good surfing conditions, and is a famous stop on the South American backpacking trail. - Lima has a slightly seedy reputation, but this proud city is home to some great museums and awe-inspiring cathedrals, and its restaurant scene is to be savoured. Read more about Peru Attractions. - The Inca Trail, a rewarding hike to the legendary ancient city of Machu Picchu, is an absolute must for first-time visitors to Peru. - Don't miss your chance to cruise the waters of Lake Titicaca. - Go see the Nazca Lines, a series of ancient geoglyphs whose origin and purpose remain a mystery to this day. - Hike through the Colca Canyon, a spectacular gorge where enormous Andean condors soar overhead. Read more about Peru Activities. Cheap flights to Peru are easy to find from the UK and US. Direct flights to Peru are widely available from US cities, while visitors from the UK might have to book a connecting flight to Peru. The flight time to Lima is about 20 hours from most North American and European destinations. Get more information on Peru Airports. The Conquest of the Incas by John Hemming and Aunt Julia and the Scriptwriter by Mario Vargas Llosa. The Dancer Upstairs (2002) and Touching the Void (2003). Anticuchos (kebabs made from marinated beef heart), ceviche (raw fish marinated in lime juice), or - for the adventurous - the Andean delicacy cuy (guinea pig). Pisco Sour, a drink made from the unique grape brandy of the region, and emoliente, a viscous herbal tea. 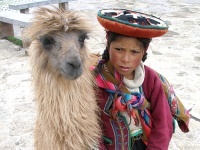 Brightly-dyed alpaca woollen products, carved figurines, jewellery and traditional musical instruments like pan flutes (zamponas) and skin drums. If you're attempting the Inca Trail, be sure to pack warm clothes and good quality, worn-in walking shoes. If you're planning on spending some time in the Amazon, pack lightweight (and preferably long-sleeved) garments and effective mosquito repellent. The Lord of the Miracles Festival (October) is the most spectacular of Peru's religious festivals, with tens of thousands of participants dressed in bright purple. The Fiesta de la Vendimia de Surco (March) is a wine festival held in celebration of the grape harvest, and featuring fascinating cultural performances. - Avocado pears (palta) are originally from Peru. - The Peruvian root known as Huanarpo Macha is what Viagra is made from. - There are more species of bird in Peru (1,700) than in any other country. Famous Machu Picchu is only one of the wonders that adventurous explorers will find in beautiful and mysterious Peru.